Actives’ Snowsports school offers Ski & Board lessons in Scotland from Cairngorm Mountain, The Lecht and Nevis Range. The resort for the lesson will be chosen on the day due to on the day conditions. Based from Aviemore & Newtonmore we select the best conditions for which resort the lessons will operate. 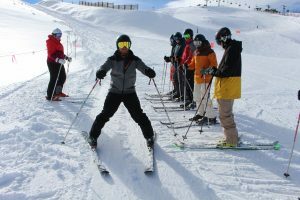 Suitable for beginners learning to skiing and for those who have mastered the basics and want to develop. Our professional and qualified Snowsports instructors will work with you to reach your goals. Your lesson cost includes ski & ski boot equipment hire, lift pass and 4 hours of instruction. Transport from Aviemore & surrounding area to the ski resort is also included. If there are members of your group not participating but are looking to come and watch, if we have space in the vehicles we can look to accommodate this. Children under 11 years of age require to have an adult present at the slopes for the duration of the lesson. Use the size guides to work out what equipment you require for your lesson. Click here to bring up the size guides. If you are uncertain about your exact shoe size we advise that you go up a half size as boot volume can be easily reduced. If you need assistance working out your ski or board length please give us a call on 01479 780 000.